Geologic information by Edward F. Stoddard (in Bold Text). Mileage and Trail section descriptions from Mark Edelstein with updates from March – April 2011. 6.3 – By dead end of Possum Track Rd reenter woods. 3-A: If the woods are not too overgrown, here is a nice view of the Falls Lake Dam to the right. A little farther along, you can see a huge rock exposure to the north of the dam. This is where Falls leucogneiss was blasted to create an emergency spillway for the lake. 6.5 – Cross a low-lying footbridge and soon, another one. 6.6 – Cross a paved access road. 3-B: Here you will encounter a pile of boulders of amphibolite. The rock is banded and has a salt-and-pepper appearance. We have crossed back into the Crabtree terrane, but it would be hard to tell from just these rocks, because amphibolite also occurs as pods in the Falls Lake terrane. 6.9 – Cross some former logging roads and soon move into a wildlife clearing. Walk through this for the next 0.6 mi. 7.1 – Cross a low footbridge over a creekbed. 3-C: You may see some sparse greenish rocks, ultramafic varieties, through here. 3-D: You may note a row of soapstone and actinolite chunks on the right side of the trail, placed there for stabilization. 7.5 – Move out of the wildlife clearing and walk on a short footbridge. Catch a view of the lake but soon leave it. 3-E: You will encounter a big pile of soapstone boulders by the remains of an uprooted tree. The rock is grayish green with some larger flakes of green chlorite amidst the grayish talc. In addition you may see some dark green rectangular grains of actinolite. As you move on, you'll see lots of soapstone between here and the next bridge. Some of the soapstone pieces have small cavities in them where crystals of a soluble mineral used to be. 7.7 – Cross a footbridge over a small creek. 3-F: There are boulders of soapstone in the creek around the bridge, while about 100 feet downstream there is an outcrop of weathered schist. If you examine the schist outcrop, you’ll see that it is so soft you can easily break it with your bare hands. The golden or bronze-looking flakes are a mineral called vermiculite, which results from weathering of biotite (black mica). It’s the same thing used in potting soil. Rock that is weathered like this schist may retain its original structure but become extremely soft. Such material is intermediate between rock and soil, and is called saprolite. It forms mainly by the transformation of hard original minerals, mostly feldspar, into clay. 7.8 – Move back to views of Falls Lake. 8.1 – Cross a footbridge and soon, an old roadbed. 3-G: Here there is a pile of quartz on the left, and on the right one boulder with quartz and a few crystals of kyanite. 8.6 – Cross a small creek on a footbridge. 3-H: At this bridge, you will see an excellent outcrop of garnet-bearing schist (Figure 3-H). You may notice that the foliation (layering) of the schist here is not as steeply inclined as the rocks we have passed up to this point, but more nearly horizontal. In fact, at this exposure, the schist is dipping moderately (about 20°) toward the northeast. On geological maps, geologists record the strike and dip of rock layers in a region. In this way, they identify large-scale folds in the rocks. The folds, in turn, tell us about major compressional forces in the past that bent the layers, such as when two tectonic plates collide, as with India and Asia, or 300 million years ago when the ancient African and North American plates collided. 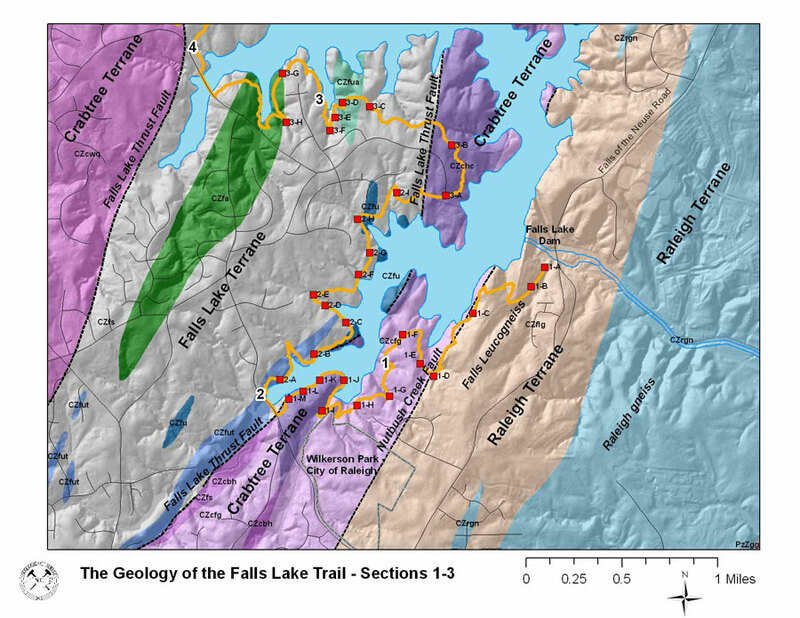 On the geological map of this area, you can see that the trail passes from the Falls Lake terrane in Section 1 into the Crabtree terrane near the start of Section 4. The trail will wind its way across this part of the Crabtree terrane, and re-enter the Falls Lake terrane at Section 6. You will pass across the hinge-line of a major fold, the Raleigh anticline, with the underlying Crabtree terrane rocks exposed in the middle, and the overlying Falls Lake terrane rocks wrapping around the fold’s nose, making a big arch shape on the map. 8.8 – Cross a footbridge by a large drainage pipe. Possum Track Rd is directly above you. 9.2 – Turn R off a narrow path that you’ve been on for the last 0.1 mi. 9.3 mi – Walk up a concrete culvert to arrive at Possum Track Rd. Turn R to walk across the causeway.